Poached pears tend to show up at at fancy dinner party dessert time, often wine-soaked, occasionally alongside a scoop of ice cream, and altogether decadent. When prepared with bright Meyer lemon and a good squeeze of clover honey, though, they become a daytime-friendly snack, perfect for forking up on their own or eating over a bowl of yogurt, with a little of their sweet poaching liquid drizzled over the top. If you’ve never poached pears before, don’t sweat it. It’s easy if you follow a few simple guidelines! Here’s a little bit of advice based on my experience. 1. Use varieties well-suited to poaching. Choose a smooth skinned, round-bottomed variety such as D’Anjou or Bartlett. They’ve got silkier flesh than Bosc and Asian pears, which tend to be a bit grainy even when cooked. 2. Buy slightly underripe fruit. Purchase your pears while still firm, before they’ve reached their dentable, fragrant peak of ripeness. You don’t want completely rock hard, starchy specimens, but they should be solid enough that they’ll withstand a slow simmer without turning to mush. 3. Don’t be fussy about it — quarter your pears. Quartering pears before poaching makes them easier to cook evenly, not to mention less precious on the plate than a whole, bestemmed-but-naked fruit. It also means you can get the whole job done with just a vegetable peeler and a knife, foregoing any tricky coring business. Furthermore, the sliced pears nestle close together in the pot, meaning you’ll need less poaching liquid to cover and cook them. 4. Reduce the poaching liquid. There are two slightly tedious parts of this recipe: peeling eight pears, and waiting for their poaching liquid to reduce. And really, one of those is just a waiting game. Check on the poaching liquid frequently as it boils down — you want it to be the consistency of warm maple syrup. 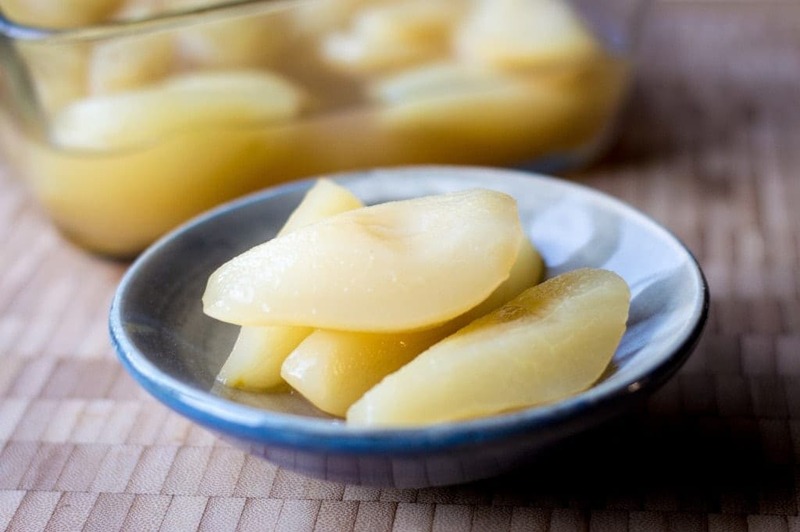 The pears will soak in their liquid after cooking, absorbing its concentrated flavor as they chill. Pears are one of my favorite fall-to-winter fruits. They’re complemented by fall’s baking spices (a maple cinnamon version would be lovely), as well as winter’s citrus. Enjoy these while they’re the best option at the market, savoring cold-weather produce at its best. There will be time for berries, melons, and the like, but now is when the pear is in its prime. And that’s it! Go forth and simmer up some silky, delicious poached pears. Stored in their syrup, they will keep for a few days in the fridge, getting sweeter the longer they soak in the honey lemon syrup. Whether you bring them to a potluck or keep them all to yourself, it’s worth making a full pot. Honey-soaked pears with a hint of lemon. Serve 'em at breakfast, over yogurt for a snack, or with ice cream for a simple dessert. Peel and quarter the pears, then remove the cores. Place them in a large (5-quart) heavy-bottomed soup pot or dutch oven. Use a vegetable or paring knife to coarsely zest the lemon into the pot, then slice it in half and add the juice to the pot as well. Add the honey and water. Place the pot over medium heat and bring up to a boil. 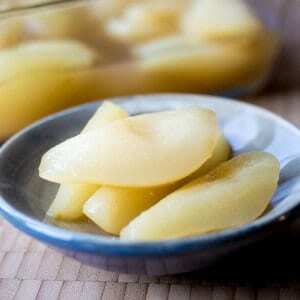 Turn the heat down to low and let the pears simmer, covered, for 20 minutes or until translucent and fork-tender. Remove the pears and lemon zest from the pot with a slotted spoon. Transfer the pears to a medium bowl, and discard the zest. Turn the heat up to medium low, and boil the poaching liquid until it has reduced to 1 1/4 cups and reached a light syrup consistency, about 35-40 minutes, stirring every five minutes or so. Pour the reduced liquid over the pears and refrigerate, covered, for at least three hours or up to overnight.